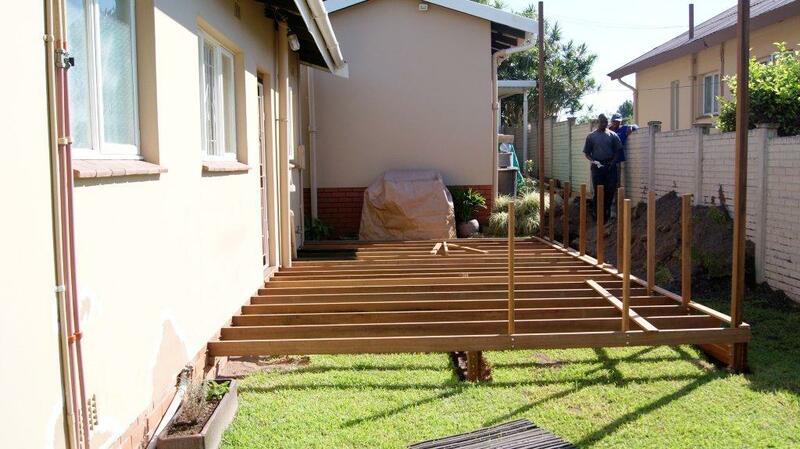 This was our second deck we installed in Durban and this time around we got the spec right and didn’t spend all our money on timber. The deck was pretty much on ground level but still required normal 30 x 102 joists as it was not supported by a concrete base. Should there have been a concrete slab on which to support it then we could have used smaller batons instead of joists. We still sued a cleat and beam system although later in my Sundeck installer career I learned the other method of a joist as the cleat attached to the wall with the joists Téd off that and a fascia beam on the front. There was a fair amount of digging to get the garden to the correct level as the one side was quite a bit more elevated than the other. This deck had a floating step which was quite large, bigger than a normal tread. 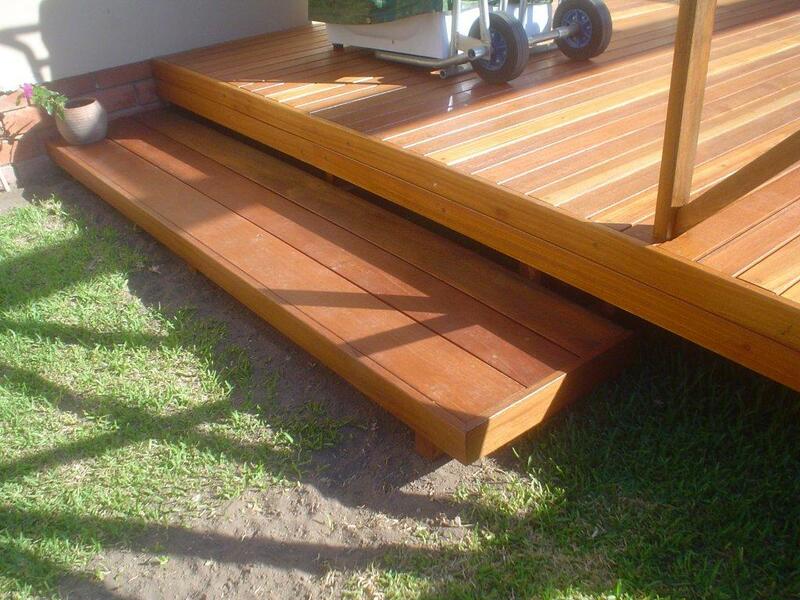 It worked very well in that it appears that the step is not attached to the deck at all and is large enough to step down comfortably on to it. Being our second deck we set everything out and started decking it. Half way through our deckboards we realised that the front beam was not straight. It bowed inwards and as the deck boards went down it became more and more noticeable. So all the deckboards came off, the beam was straightened and back they went. A costly mistake in time but a lesson learnt that will ensure that that mistake never happens again. A simple piece of fish line or builder’s line must be placed along the front edge of the beam when fastening the joists to ensure that it is straight. A false joist can be used here in the middle of the beam attached in the same direction as the joists will lie to hold it in place while the joists go down. The same rule applies for joists. When I joist is placed down it must also be square off the wall and the rest of the joists must be parallel to that one. Timber will always be bowed in one direction or another, some more than others. But they must be pulled straight before being attached. In the case of joists this will ensure that they screw line on the deckboards is straight and more appealing to the eye. Also it keeps the distance between joists exactly 550 between centres for the entire length of the joist. This is particularly important on joists that are placed on the end of the deck as the deckboards will be cut there and if not straight then the deckboards will either not be straight or they will form a lip where the joist bows inwards or outwards. The balustrade on this deck was pretty straight forward to. We notched the cross pieces so that they fitted snuggly together in the same plane rather than overlapping them. We built a pergola in balau above which eventually took a roof. The client however attended to the roof sheeting. 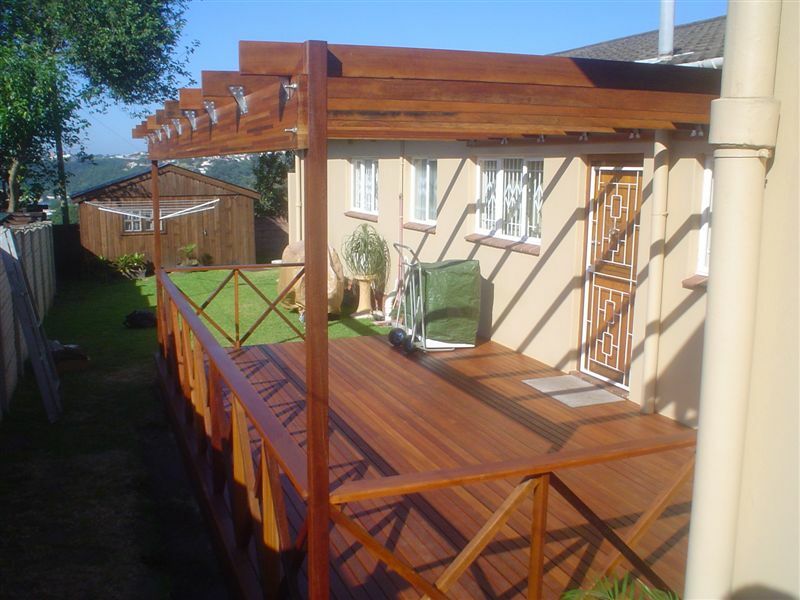 This entry was posted in Pergola, Stairs, Wooden Deck Builder Durban, Wooden Decks and tagged Business, Construction and Maintenance, deck, Durban, Lumber, pergola, stairs, Sundeck, timber, wood, wooden by Garrick Dunstan. Bookmark the permalink.